Student board member Caroline Binkley is sworn in by DCS Treasurer Melissa Lee at the board meeting on June 18. The Delaware City Schools Board of Education meeting today will be the first one since new student board member Caroline Binkley took the oath of office last month. 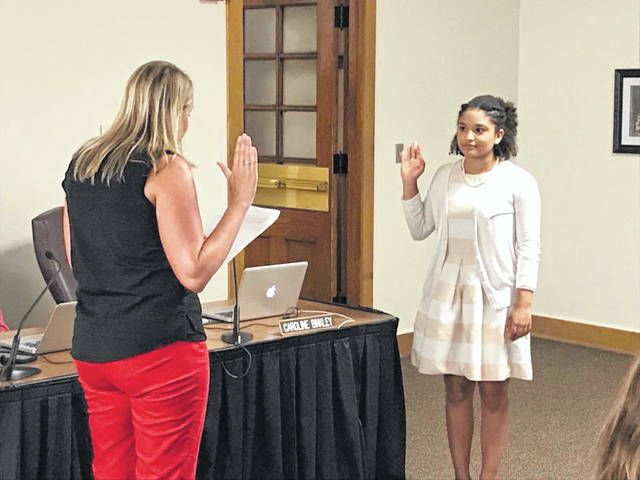 Binkley, a Hayes High School senior, was sworn in at the June 18 board meeting after being approached in April by Hayes High School Principal Richard Stranges, who asked if she was interested in joining the BOE as the student member. As the student board member, Binkley will attend meetings and be able to symbolically vote on resolutions with the rest of the board. Binkley said she has been attending Delaware City Schools since she was in first grade and is excited to give her perspective to the board. Binkley said she is involved in musical theater, where she recently played the dragon in the spring production of “Shrek: The Musical.” She is also involved in the Tri-M Music Honor Society, Hayes Singers, symphonic choir, student council and diversity club. Binkley said she’s already talked to other board members about what’s going on in the district. “I get to see how much they are really doing,” Binkley said. Binkley added she talked with board members about the House system at Hayes, where students are divided into eight houses that compete during the year in an effort to increase student relations and break up cliques. “It’s those little things; hearing about how our school is impacting other students around me that gives me a lot of joy and passion,” Binkley said. Binkley is currently planning to major in business when she graduates, and the opportunity to be on the board will be a great learning experience and look good on a college application, she said. “I will do everything in my power to make our school system a safe and educational environment,” Binkley said. Binkley replaces Charlie Zimmerman, who graduated in May and will be attending the Ohio State University this fall.